It has been years that I’ve eaten Nasi Dagang. I’m sure many of you have never heard of this dish. It is a dish that is very popular in the East Coast of Malaysia. Even up till today, Nasi Dagang could hardly be found in the West Coast of Malaysia. 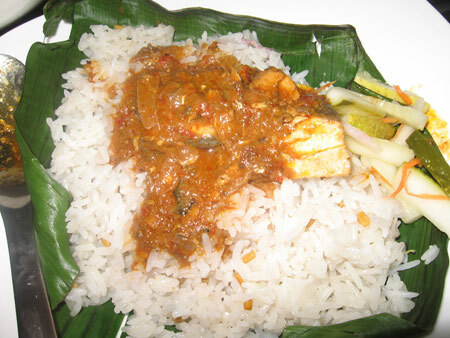 Nasi Dagang is typically served as a breakfast food in Kelantan, Trengganu and Pahang. Nasi Dagang is actually a rice dish that is served with Gulai Ikan Tongkol. Ikan Tongkol is the Malay word for tuna fish. The word “gulai” is actually a Malay word for a certain type of cooking. Since there’s no English word for gulai, it is commonly referred to many as Malay Curry. The color looks like curry but it does not uses any Indian curry powder to prepare this dish. What makes Nasi Dagang special is the way the rice is being cooked. The rice is soaked in water and then later steamed together with coconut milk, lemongrass, slices of ginger and fenugreek seeds. Some Nasi Dagang rice is actually a combination of plain rice and glutinous rice. Certain area uses a kind of wild rice that is slightly brown purplish colored rice. I remember when I first tasted it as a kid during my holidays in Trengganu, one packet of Nasi Dagang would cost RM0.20. This was probably 30 years ago. The Nasi Dagang is normally wrapped in a cone shape with banana leaves. I remember how my dad would wake us up early in the morning just to go to the famous stall in Trengganu just to get the freshest Nasi Dagang. A hot Teh Kosong ( hot tea with just sugar ) would be my choice of drink and it cost RM0.20 too. I’ve never encountered anybody selling Nasi Dagang in Singapore. Based on my experience, I am pretty sure this dish can do very well here in Singapore. So how did i get my Nasi Dagang in Singapore? Well, allow me to gloat for a moment. I got it by presumably being a nice guy. I have a friend whose name coincidentally is Alex too. He is from from the East Coast of Malaysia but he works in Singapore. So during the long weekend of Deepavali, he went back to his hometown. Since he knows I will be in Singapore coming back from Thailand, he told me that he will fly back some Nasi Dagang with him. True to his words, he kept his promised and flew back to Singapore on Sunday with a few Tupperware filled with Nasi Dagang. If he were to drive, I don’t think this is possible as the long journey would make the rice go bad. ( Coconut infused dish is easy to get spoil with heat ). I had a blast on that Sunday “whacking” the Nasi Dagang with no mercy and shame. It is little things like this that makes me so happy with life. I felt like the richest man in the world ( even though my bank account contradicts this statement )by having Nasi Dagang flown back specially to me. I would like to take this opportunity to thank my friend Alex for making the effort to fly back the Nasi Dagang. I will be waiting for your next trip to East Coast Malaysia and eagerly awaits for your surprises. Hahahahha….I know I am pushing it. yummy.. lets go to trengganu now! The nearest place to get nasi dagang is Mersing at the wet market. They are done by migrants from the north. Ah..thanks for the info Bob…not sure if many Singaporean are familiar with Nasi Dagang. Even most West Coast Malaysian not familiar with this dish. But I bet if they try it, they will fall in love with it.